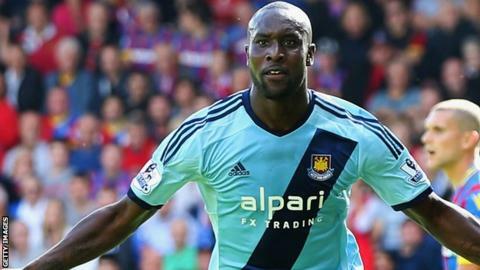 Former Chelsea and West Ham striker Carlton Cole will train with Celtic this week with a view to signing. The 31-year-old free agent, who left the Upton Park club during the summer, was at Celtic Park on Sunday to watch the champions' 6-0 win over Dundee. "We will have talks with him and see him in training as well, this week, I think," said Celtic manager Ronny Deila of Cole, capped seven times by England. "We will see if it is something that will happen or not." Deila added: "It is not [a trial]. He has been in London his whole life, so he has to see what he is coming to and then we will see if it is something that he likes and we like as well. "I think he is a very good football player and he shown in the Premier League and also the Championship that he can score goals and he is different to what we have. "He is a target man, very good in the air and strong and that is something that, if everything fits, could be good for us." Celtic made a late bid to sign Scotland and Sunderland striker Steven Fletcher in the closing hours of the transfer window, but his club would not allow him to make the move. Deila's side controlled the game against the Dark Blues and the win keeps them five points behind league leaders Aberdeen, who won 3-1 away to Hearts. Tom Rogic and Leigh Griffiths gave the champions a 2-0 lead at the break. Left-back Emilio Izaguirre scored twice in six second-half minutes before missing a penalty for his hat-trick and then skipper Scott Brown and substitute Nadir Ciftci added late goals. The Norwegian said of Izaguirre's spot-kick, which was blazed over Scott Bain's crossbar: "I haven't seen many worse penalties in my life. "There was too much pressure, he had to wait a few seconds and I think he was thinking too much. "We could have scored much more and that is a good thing when you win 6-0. "It is too early to talk about the league but you have to put in good performances and win games. In the end we will see who is the best team." Dundee manager Paul Hartley commented that his team had produced "a poor performance". "It was unacceptable. It was a really bad day that we had," he said. "We had one performer and that was the goalkeeper. If it wasn't for him it could have been more. "We had 10 players off it and I think the players know that because they have been good for the majority of the season. "We have got to regroup again, be embarrassed by the performance, that's for sure, because it wasn't acceptable."